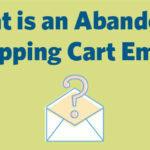 ﻿ What is an Abandoned Shopping Cart Email? » Red Mango Marketing! An abandoned cart email is a gentle reminder, from a business to a customer, about the products added to a shopping cart and ‘abandoned’ there. It happens, more than often, that customers browse through the list of products and keep adding things that they like to the shopping cart. Sometimes, because they got distracted, thought they’ll complete the checkout process later and then forgot about it, found the same thing somewhere else at a cheaper price, or just did not complete the purchase for some other reason. Well, this is a big loss for the retail industry. As business owners we may not realize how poorly this affects our sales and business. Abandoned carts lead to billions of revenue being lost for online retailers every year. Sending abandoned cart follow-up emails allows you a chance to nudge and remind your customers to go ahead and complete the purchase process. You can send them a personalized abandoned cart reminder to show them the exact products that they left behind and give them another chance to complete their order. Salesforce data shows that 60% of cart abandoners went back and purchased the products after receiving an abandoned shopping cart email. Abandoned cart follow-up emails, also known as abandoned checkout emails, are like reminder emails for the customers. Even better – they can be automated. Using email automation for your marketing efforts can make the process of sending abandoned shopping cart emails easy and effective. Email marketing has proven to be every marketers most preferred approach to connecting with customers and building a brand identity. Even with many social media platforms allowing businesses to connect with customers, email marketing continues to be the most widely used and effective method to do so. Retail email marketing is all about building a relationship with your customers by being present where they go everyday: their inbox. From newsletters to deals and promotions, important announcements to holiday greetings; emails are the perfect way to stay in touch and make your customers take the desired action. Apart from helping you send personalized, good looking, effective and irresistible abandoned cart emails, you can also keep track of how your customers are responding to your email marketing efforts. You may be asking why the need to get into the technicality of ‘email marketing’. Why not just write an email and say, ‘Hey! You forgot some items in your cart. Complete the order now’. The question I ask is, how many of such individual emails will you type and send? How will you keep track of who left behind what items? How will you make sure your email gets noticed in the very busy and bustling inbox of your customer? How will you make the navigation process easy that allows the customer a one-click order completion experience? The list goes on. I ask a lot of questions. But, hey I’ll answer them too. With email marketing you can easily track and automate every abandoned cart email you send. You don’t have to manually design and create an email every time a customer abandons a cart. More importantly, specific integrations and apps allow you to personalize the process too. For example, Constant Contact’s official Shopify App allows all Constant Contact users an easy, fast, personalized and effective email marketing experience. Tip: You can now easily get the Constant Contact for Shopify App and up your email marketing game! Just head to the marketplace. Getting back to this wonderful thing we call an abandoned cart email, if you are an online retailer this is going to be your revenue’s next best friend. You don’t want to lose out on revenue just because someone forgot about some great products in their cart, right? Create a master template that will be used for every abandoned cart reminder you send out. This will include the brand logo, brand colors, contact information, other necessary information and the call-to-action button. Make sure you place the abandoned cart email call-to-action button in such a way that it’s impossible to miss. And hey! Be creative with the call-to-actions in your cart recovery emails. You can use something like, ‘Yes I want to complete my order’, ‘Take me to my cart’, ‘ Let’s Do This!’, ‘I want to shop now’, ‘I am ready to shop’ etc. Integrating your online store with your email marketing platform will make it easy for you to automate the process of sending personalized abandoned cart emails. This will also help you keep track of how many people are actually going ahead and completing the order. The messaging in your abandoned cart email reminder plays a very important role in determining whether or not the customer will be inspired enough to take an action. You don’t need to write long paragraphs; just be crisp and to the point. The subject line to your abandoned shopping cart email deserves all your attention and creativity. It’s the first thing cart abandoners will see and you want it to be intriguing and interesting enough for customers to go ahead and open the email. You can browse through some abandoned cart email subject line ideas to spark inspiration and increase open rates. PS: You can also try A/B testing your subject lines to see what works best with your customers. The thing is you don’t know at this point as to why the customer abandoned the cart. If it was a plain case of getting distracted or forgetfulness, great. Your reminder abandoned email cart should drive them back in and complete the order. But there could be other reasons like a high price or a high shipping cost. You can use this opportunity to not just make them complete their order but also make the most of a ‘special incentive’ or offer. You could add free shipping, a discount coupon or a last chance sale price as an incentive to purchase. Constant Contact has launched it’s all new abandoned cart and coupon block feature. An integration of your Shopify eCommerce store with Constant Contact will now allow you to easily insert products and coupons right into your email campaign. You can now send targeted abandoned cart emails and automate the process. This integration will help you recover losses in just a click. When a customer abandons a shopping cart you have two options: be disappointed about it and lose out on revenues or send a great abandoned cart email and have the chance to make this a successful sale. What would you do? Smart business owners understand the need to take every measure to make a sale. Sending an abandoned shopping cart email is one of those measures. This email will also help you build a more open communication with your customers. You can show them that you care about what they think. This abandoned cart email could help you get real feedback about your products and services. A lot of businesses add a “How can we help make your experience better?” kind of questionnaire to show their customers that their feedback matters. This is also a great way to know why the customer abandoned the shopping cart in the first place. As a small business owner you spend all your time and efforts in making your business successful. Every step counts and every step in the right direction leads to great success. Email marketing for small business owners is the easiest way to stay in touch and stay top of the customer’s mind. It’s efficient and cost effective, allowing you to bring value to the customer’s inbox. An abandoned cart email not only delivers value to the customers but also to you. The customer’s benefit by being reminded of the products they left in the shopping cart; and further take the action to either complete the order or empty the cart. This in turn benefits you because you reduce cart abandonment, don’t lose out on sales and revenue, connect with your customers and (if you are lucky) also get some great feedback to improve your products, services, and e-commerce business as a whole. Craft your abandoned cart email as a reminder. Don’t try to make this another promotional or sale-sy email. You want to remind people to complete the order not push them, or worse, drive them crazy by spamming their inbox. Next time someone asks you what an abandoned shopping cart email is, just say, “It’s a gentle reminder email to customers to hurry up and buy all the wonderful products that they added to the shopping cart and left there.” Yes, it’s that simple. No long explanations or technical jargons- plain and simple. If you have the potential and courage to be a small business owner, you definitely have it in you to ace email marketing too. You got this. The post What is an Abandoned Shopping Cart Email? appeared first on Constant Contact Blogs. This entry was posted on Thursday, January 3rd, 2019 at 12:11 pm	and is filed under Email Marketing, News & Updates. You can follow any responses to this entry through the RSS 2.0 feed. Both comments and pings are currently closed.